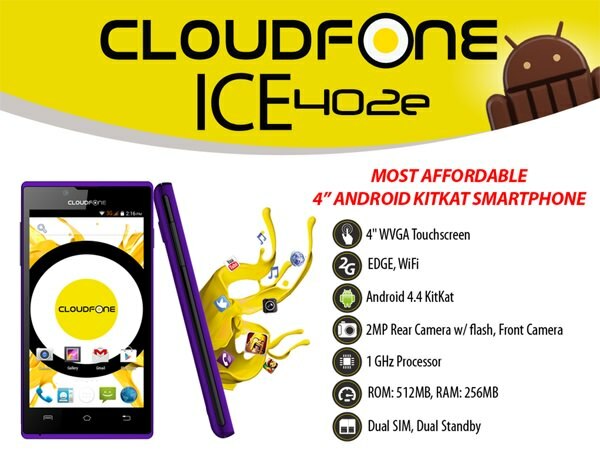 Home › Recent › CloudFone Ice 353e, Ice 402e, Excite 356g: Ang Sarap Mag-KitKat! CloudFone broke boundaries back in December of 2012 when they introduced the CloudFone Ice 350e – the most affordable Android smartphone in the country. Before it, having a smartphone below the price of Php 2,000 was a myth, something absolutely unheard of; but staying to its promise of Android for All, CloudFone was the first to penetrate that barrier. Now, CloudFone is back to bringing innovation at its most affordable by bringing you the most affordable Android Kitkat Smartphones starting at Php 1,499! An Android Kitkat Smartphone at only Php 1,499 used to be unthinkable because when you thought of being on the latest Android OS, it only meant usually meant something that only global brands would have, which also meant higher prices as well. However, with the, a smartphone running on the latest Android OS version priced at Php 1,499 is now possible, all thanks to CloudFone! The CloudFone ICE and Excite series have sold like hotcakes in the past and there’s no wondering why! As CloudFone brings the true essentials of a smartphone within everyone’s reach, now, first-time smartphone users or even those who are simply looking for entry smartphones can be on the latest Android OS version, bringing new technologies available for all and making them a reality at prices you can surely afford. Starting with the CloudFone Ice 353e, you get the most affordable Android KitKat smartphone for only Php 1,499. With this 3.5″ dual SIM smartphone, you get to stay on WiFi all day, go on Facebook, and play Candy Crush until all your lives are up. It even comes in 3 various colors you can choose from: black, blue, and red. Another definite shocker is the CloudFone Ice 402e, priced at only Php 1,699, you get the most affordable 4″ Android KitKat smartphone. Coming in black and purple matte versions, get a good looking handy device and 4″ dual SIM smartphone that’s easy on the eyes, letting you conveniently text with one hand, enjoy browsing your news feed and timelines, and even play 4 Pics 1 Word or the new Flappy Bird now that it’s back! Last but definitely not the least from this exciting line-up, the CloudFone Excite 356g is most affordable 3G Android KitKat smartphone at only Php 1,699! With this 3.5″ dual SIM 3G smartphone, you can now stay connected all day, post all your OOTDs anytime on Instagram, and play 2048 or Don’t Tap the White Tile until your frustrations on beating your own high scores are pacified. Just like the Ice 353e, it also comes in 3 various colors you can choose from: black, blue, and red. With the CloudFone Ice 353e, CloudFone Ice 402e, and CloudFone Excite 356g, these Most Affordable Android Kitkat Smartphones complete CloudFone’s newest line of innovation. Indeed, only CloudFone can give deals like these that people surely can’t resist! No more having to hold back and settle thinking that’s all that you can get for now, because CloudFone makes sure you always get more value for your money.